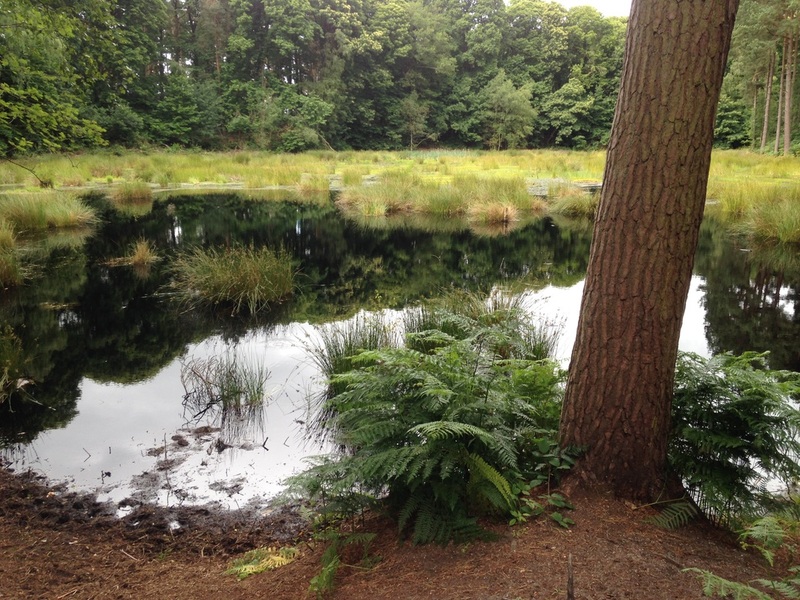 After hearing a talk at our monthly meeting last year, we asked Dr Chris Meredith if he would be willing to take members of the Walking Group on a guided walk in Delamere Forest in the hope of seeing some of the damsel and dragon fly population. This was arranged for Tuesday July 21 2015. Thirteen members met Chris and his assistant researcher, Rachel, at Barnsbridge Gate car park off the switchback road through the forest. The weather was mild, a mixture of cloud and bright periods when we set off into the forest. Our first venue was Black Lake, the original breeding place of the Whitefaced Darter until its demise during the Nineties. At this time a change in Ph levels, which rendered the water less acidic, meant the Darter could not breed so it died out. 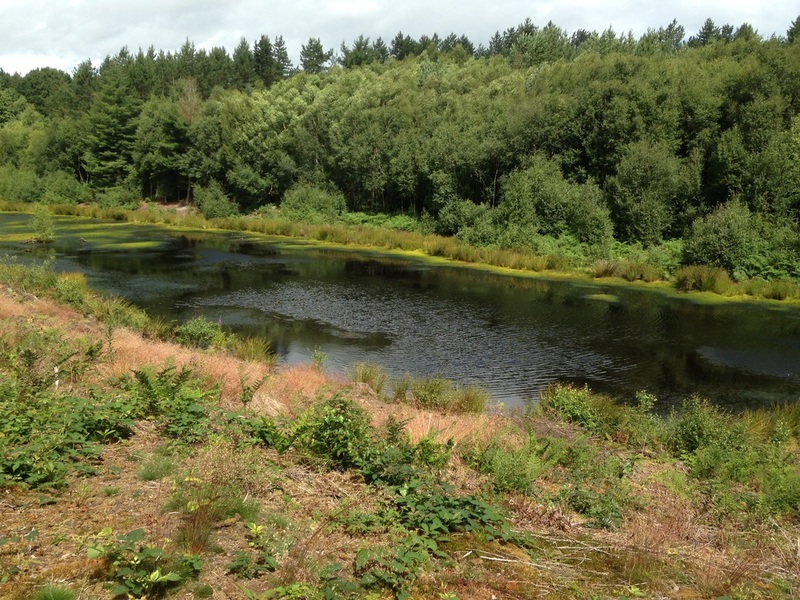 Since 2013 Cheshire Wildlife Trust, in conjunction with the Forestry Commission, has been working on a programme to restore the meres and mosses of Delamere and hopefully conserve and protect their unique flora and fauna. From Black Lake we continued through the forest to look at Linmere, an area of sphagnum bog and and other wetland flora. Part of this zone is designated as an SSSI. One of the problems here is the growth of birch, which grows like a weed. These have to be removed and the wood is converted into charcoal ,which is then sold and the proceeds go towards funding the conservation project. We then walked through to Blakemere, the large area of open water which can be seen from the road to Hatchmere.This was created during the Nineties when a large area planted with Western Hemlock conifers was felled and the land, which had been drained during the 19th century, was allowed to flood. During the ensuing 20 years the western end of this waterbody has been colonised by vegetation which is creating a raft of bog. The eastern end of Blakemere is open water and is colonised by a noisy, squawking flock of gulls. In the winter they are augmented by Canada geese. Finally we were led along an obscure path to view Pearson’s Mere, which forms part of the reintroduction project. As we reached the bank above the mere the sun came out, as did many of the 17 different species of dragonfly which are found in Delamere. Various species were spotted hurtling around over the water, although none was a Whitefaced Darter. After reaching maturity dragonflies live for only a few weeks in which time they mate and lay their eggs. From Pearson’s we retraced our steps to reach a smaller hidden mere called Dolittle. This is joined to Pearson’s by a habitat corridor along which it is hoped the Darters will move and establish themselves on the sphagnum moss growing there. Two years ago Darter eggs were introduced from a site in Shropshire. Mature adults have been observed, but it will be several years until it is known whether they have been successfully re-established. This had been a very interesting and enjoyable walk on which we had learned a lot about our local area as well as reinforcing in our minds the importance of conservation and restoration of the environment. We are indebted to Chris for giving up his time to lead us on this tour of moss land habitats. The introduction site, the small hidden mere called Dolittle.